It’s not selfish and not the first time that, let’s say, there’s been a convenient over-order…. One way of justifying this practice is to convince yourself of your absolute need to test anything you give to potential customers and repeat clients…seriously, we do it all the time and our houses are full of “gifts” to ourselves! How else do you keep your ear to the ground and know what’s hip and cool? One afternoon sojourn in The Valley, Paddington or Collingwood will confirm that large, closed cup headphones are the coolest gift in town. The benefit to you is a great branding surface – a chance to join the hipsters and be part of cool street culture. We stock a funtastic range of large fixed headphones, jazz headphones and coloured bud phones to help your marketing effort. 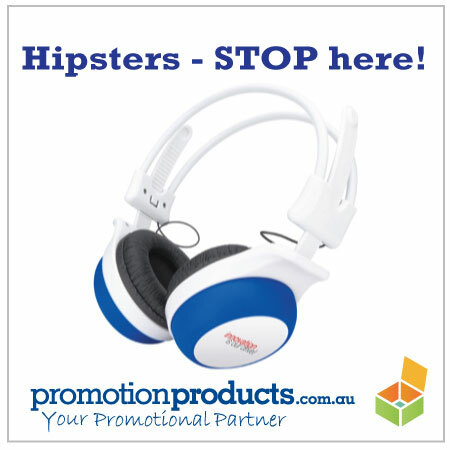 With some minimum orders of 10, you’ll find a cool, Hipster pair of cans to suit. All you’ll then need is a “fixie” bike, afro and luminous armbands – NOT the best look on anyone over 40…..but from personal experience, a great way to keep annoying folks at a respectable distance! This entry was posted in technology products and tagged Electronics, novel, technology by admin. Bookmark the permalink.